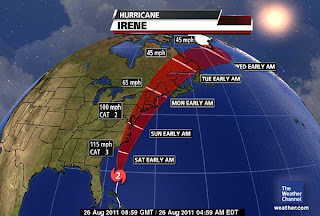 Saturday’s NON-STOP Coverage of Hurricane Irene starts @ 10am Eastern Time and I shall be updating you and keeping you posted throughout the rest of the day and night tomorrow, Stay Tuned! YOU CAN FIND FREQUENT HURRICANE IRENE UPDATES ON FACEBOOK, CLICK ‘LIKE‘ TO KEEP UPDATED WHILE I’M ON THE ROAD! 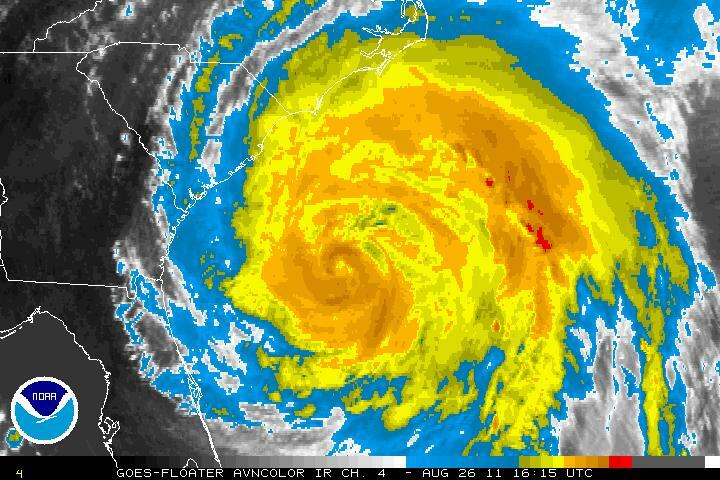 600-Mile Wide Hurricane Irene Set to Buzzsaw up East Coast, Home to Millions! Major Damage from Storm Surge, Wind & Flooding a Real Concern from North Carolina to New England! BREAKING NEWS: NEW YORK CITY, PHILADELPHIA & NEW JERSEY TO SHUT DOWN TRANSIT SYSTEM… BRIDGES LINKING MANHATTAN TO SURROUNDING BOROUGHS & NJ MIGHT BE NEXT! Irene’s eye has become more visible once again, possible sign of reorganising within her core, could she have just undergone an eyewall replacement? -Mandatory Evacuations for Sandbridge Beach, NC commence @ noon. Are you residing in a city in which your amoungst tall buildings? Well, if you are, there is an added danger if your out and about while winds pick up. Inner city locations will feel STRONGER WINDS than outlying areas and although you may feel as though your more protected by those tall buildings, well as hurricane force winds roar into the Big Cities, they hit the buildings, however, those winds must go somewhere rather than stop on the wall of a building and therefore, they pile-up and channel in between the buildings, down the streets. 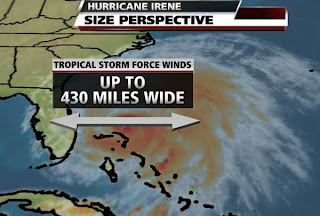 The wind tunnel within city’s during hurricanes can be extremely dangerous and you may well find in DC, Baltimore and Philly, where winds may only be around 60 or 70mph, in between buildings, the air is squeezed through those urban canyons, racing at perhaps 90 to 100mph and thus damage will be the result. Flying debris could kill you if your outside when Irene passes by, so don’t be fooled into thinking, ah, it’s not that bad, let’s go for a walk around. 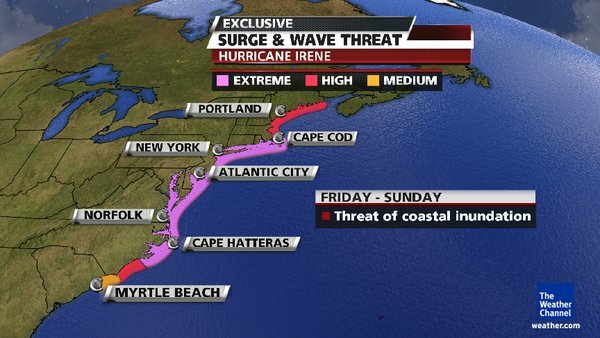 New York City being that bit closer potentially to the core of Irene, may endure sustained winds locally of 75+ mph and in between the narrow streets, wind may race at 105 to 110mph, that intensity of wind will smash skyscraper windows which may tumble onto streets below, trash cans could become projectiles, even traffic lights may get torn down. There is so many more objects in a city that could become airborne and therefore I would urge you to stay both indoors and away from windows. I fear vast volumes of water funnel up the narrowing passageways of Chesapeake, Delaware Bays, New York harbor. Lower Manhattan may be flooded via NYC harbor if a surge of 4+ feet drives in underneath the Varrazano Narrows Bridge. Surges may grow as water is squeezed in the narrows between Staten Island and Brooklyn. 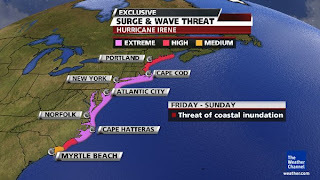 Delaware, New Jersey, Long Island Shores to see 4-8 foot storm surge. This along with hurricane-force winds would produce significant damage to beaches as well as ocean-exposed properties. When covering storms, the best moments captured! Today’s Blog Shall be updated throughout today, keep checking back for new information! >Thank you for taking time out of your personal life to do this.